Did you watch The Sound of Music Live Thursday night? Apparently 18 million people did. According to twitter, opinions were decidedly mixed. Remaking anything as loved as The Sound of Music has it's perils, especially if you are doing crazy things like performing the original stage production live on television in front of 18 million people. But it was kind of awesome. First of all, those nuns singing How Do You Solve a Problem like Maria. Charming. This scene involved singing, dancing, yodeling, jumping on the bed... all live. I was impressed. Where were the microphones, even? BTW, yes we were all expecting My Favourite Things here. Turns out this was a remake of the original Rogers & Hammerstein stage musical, not the beloved Julie Andrews film. That also explains those songs that we've never heard before, sung by lovable old Uncle Max & the Baroness Schraeder. Laura Benanti. She was awesome in Go On with Matthew Perry, & apparently she also sings. On broadway. She made Baroness Schraeder downright likeable. She also rocked some great dresses & a crazy pair of red trousers, which I now want. And then there's Audra McDonald. Carrie Underwood was not the only one crying when the Rev. Mother sang Climb Every Mountain. But I loved that they just went for it. I love the film Mamma Mia because there are no holds barred, & this felt the same way. Crazy outfits? Wild hair? Jumping on the bed? Bursting into song? Why not. It was a big, crazy thing to do but they just did it. I liked watching them attempt something so big. Also? The Sound of Music just makes me happy. And I like these two articles, which basically say "It wasn't good, but I enjoyed it," & "The Sound of Music Live was borderline unprofessional. Also: Terrific." 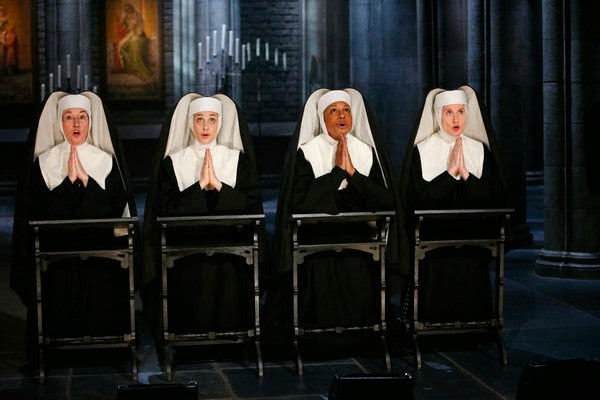 Daughters of Glenda--I heartily agree--this Sound of Music was wonderful in it's own way and I say, as you did, kudos to anyone who will sing live! on television! running up and down stairs in heels. Oh, and Audra Macdonald DID make me cry. I loved every minute of it. I loved it. Carrie Underwood was amazing and I was also very impressed with the actress who played 'Liezel'. It was a really fun night & this was a fun post!